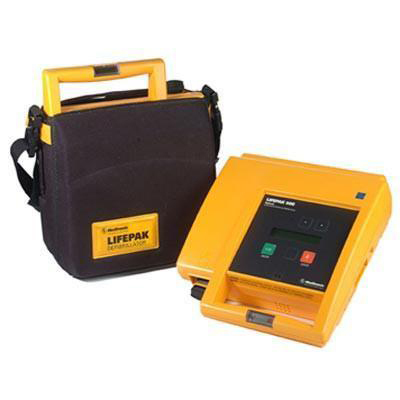 The LIFEPAK 500 gives you choices in configurations to help make a future rescue easy. For example, depending on the method of CPR you've been taught, you can program the device to prompt for pulse checks. You can change the timing of CPR interval in case the "rules" of CPR ever change in the future (again!). You can program an instruction to perform CPR while the AED is charging! Medical professionals can activate an asystole detector, too. 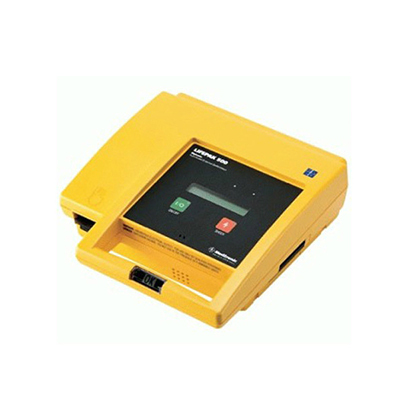 Electronically assign a unique device ID to the LIFEPAK 500 so you won't have to put labels, stickers, or magic marker identifiers on your AED. You can do all of this without the need to buy reconfiguration software packages or computer peripherals. The only optional software you may want to consider is to download post-event patient data from the device if needed. Designed to be used by first responders to cardiac emergencies. Determines which shock is right for the individual, and ensures safe, simple delivery for widespread deployment. Fast & Simple Sleek, lightweight design for grab-and-go portability. The 500 weighs just seven pounds. Clear screen messages, voice prompts readiness display and lighted buttons guide responders. Intuitive design ideal for infrequent or inexperienced users. 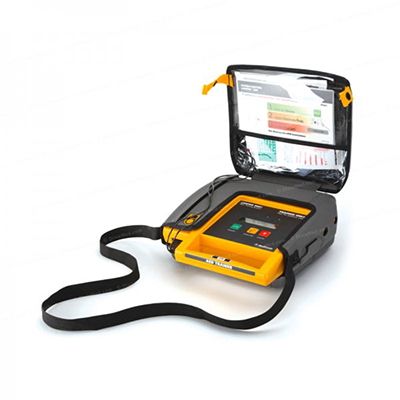 Pre-connected QUIK-COMBO electrodes with REDI-PAK preconnect system save valuable time on-scene. Electrode diagrams illustrate optimum placement. Versatile & Affordable ADAPTIV Biphasic Technology waveform, capable of delivering shocks at energy levels consistent with current American Heart Association and European Resuscitation Council Guidelines. Choice of two or three button models. The standard is three buttons: on, analyze, and shock. The streamlined model has two buttons: on and shock. Compatible with LIFENET data management system. Choice of maintenance-free lithium or rechargeable lead-acid batteries. Sensibly priced. Rugged and Reliable The field-tough design is proven in real-world emergency conditions. Automatic self-testing helps ensure your device is ready to go. Weight: Monophasic version – 6.2 lbs (without batteries and electrodes), biphasic version – 5.3 lbs (without batteries or electrodes. 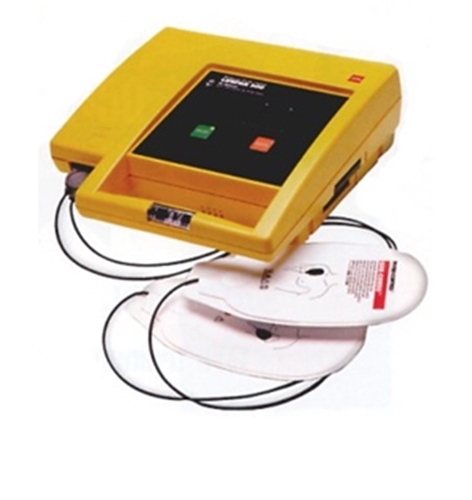 Input: ECG via QUIK-COMBO or FAST-PATCH® disposable electrodes. Standard placement (anterior – lateral). Electrical protection: Input protected against high voltage defibrillator per IEC 60601/EN 60601. Waveform: Monophasic pulse (Edmark) per AAMI DF2-1989, 3.2.1.5.1. Biphasic truncated exponential, with voltage and duration compensation for patient impedance. Output energy sequence: Monophasic: 200, 200, 360 joules (360 joules thereafter) or 200, 300, 360 joules (360 joules thereafter). Biphasic: three levels, user configurable from 200 to 360 joules, delivered (level 1, level 2, level 3, level 3 ...). Charge time: with a new, nonrechargeable battery pak, or a new fully charged rechargeable battery pak: 200 joules in less than 9 seconds, 360 joules in less than 15 seconds. Controls: ON/OFF – turns device power on or off. ANALYZE (optional) – starts ECG analysis. SHOCK – delivers defibrillation energy. Active only when shock advisory system advises defibrillation. Clock Ste: Two switches are provided to set the clock. Display: two- line, 20-character per line dot matrix liquid crystal display. Low battery indicator: low battery icon: at least 11 discharges remaining with nonrechargeable battery pak. At least 6 discharges remaining with rechargeable battery pak. Displayed messages: messages prompt user through complete operating sequence. Audible tones: Coded tones assist user through device operation and alert operator of display messages. Voice prompts: prompt user through complete operation sequence. actions: at least 20 minutes if unit is configured with audio recording and audio recording setup option is ON. At least 80 minutes if configured with audio recording and setup option is OFF. At least 60 minutes if not configured with audio recording. Report type: CODE SUMMARYTM report, Event Log report, and Test Log report. Capacity: 300 Event log events. 30 Test Log device tests (assuming no fault codes). Data Review: LIFENET® system compatible. Rechargeable SLA Battery Pak – Type: sealed lead-acid, 8V, and 2.5 amp hours. Capacity: typical: 59 full discharges or 3 hours of ON time with a new fully charged battery. Minimum: 43 full discharges with anew, fully charged battery. Battery charge time: 10±1hours. Battery charging limited to +15° to +35°C (+59° to +95°F). Recommended replacement interval: 2 years or 200 battery charge/discharge cycles, whichever comes first using recommended battery maintenance procedures. Nonrechargeable Lithium Battery Pak – Type: sealed lithium, 12V, and 7.5 amp-hours. Capacity: typical: 312 full discharges or 14 hours of ON time. Minimum: 230 full discharges with anew battery. Shelf life: 5 years (4 years for aircraft use). Operating Temperature: 0° to 50°C (+32° to +122°F). Storage Temperature: -30° to +65°C (-22° to +149°F) without battery and electrodes. -30° to +65°C (-22° to +149°F) with battery and electrodes, maximum exposure time limited to one week. Atmospheric Pressure: 760 to 429mmHg (0 to +15,000 ft above sea level). Water Resistance: IEC 60529/EN 60529 IPX4 “Splash-proof” with electrodes or connector cover installed. Shock: MIL-STD-810E, Method 516.4, Procedure 1 (40g, 6–9ms pulse, 1/2 sine each axis). Vibration: MIL-STD-810E, Method 514.4, Helicopter—Category 6 (3.75 g rms) and Ground Mobile—Category 8 (3.15 g rms). RTCA/DO-160C, Table 8–2 Fixed Wing—Turbojet Engine Classification C’ (Fuselage). Test level per Figure 8–5 C’. One hour in each of three axes. Aircraft: RTCA/DO-160D, “Environmental Conditions and Test Procedures for Airborne Equipment,” Section 21, Category M, (Radiated Emissions).